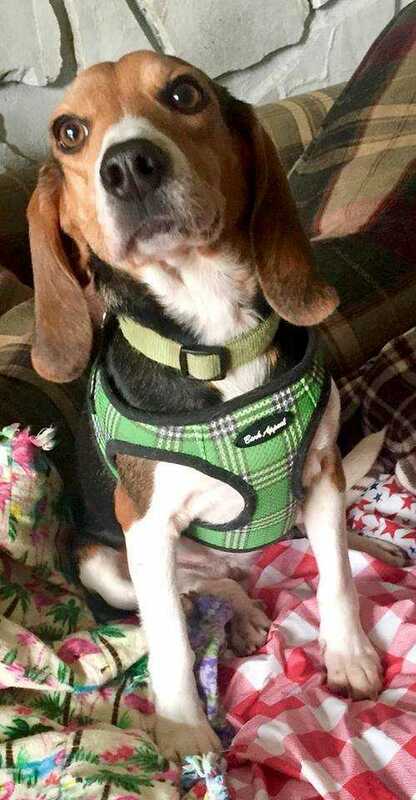 Thelma is a 5-6 year old beagle who is quiet the the love bug!!! All 21 lbs. of her! Miss Thelma is quite the doggie. She has a lot of personality and is very hard not to love. She Gently reminds you to pay attention to her by gently giving you a love pat on the face. She is Scared of loud noises or sudden ones nor does she like other dogs barking, she seems to get really scared. She needs to be feed in a slow feeder bowl in small amounts at a time. To which we feed 4 small meals a day. She loves treats, chew bones, rawhides and antlers. She Loves to lay in someone’s lap and have her chest rubbed. When she is called she comes pretty good. She loves Food and is motivated by praised, she aims to please! She is Learning to play with toys and other doggies. She is afraid of cats basically unsure about them . She is learning to be on a leash and when she masters it will love to go on walks. She Rides well in the vehicle. She is Just about potty trained but does not tell you by going to the door. She get antsy and restless. When you ask her if she needs to go outside she goes to the door. Thelma is a wonderful doggie that would make a great companion to someone who is home most of the time as she just needs to feel secure and to be with someone. She does not like to be alone and gets really anxious when by herself. She also likes having her safe spot with a blanket and pillow and loves to be covered up at times, mainly when she is cold or scared. She loves to wear her little jacket outside. Thelma is current on vaccinations, HW negative, spayed and micro chipped. She is fostered in Lincoln, NE. Her adoption fee is $225.00.